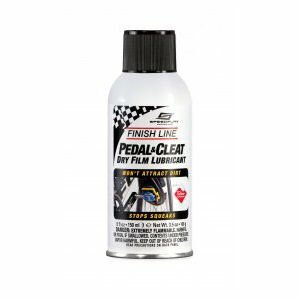 Pedal & Cleat Lubricant is formulated specifically with DuPont Teflon® fluoropolymer and surface bonding resins to create an ultra slick, protective dry film. This film does not absorb abrasive contaminants, which reduces friction, prevents annoying squeaks and premature wear. It also helps prevent corrosion by repelling moisture. Pedal & Cleat Lubricant was designed and formulated to maximize the performance of any pedal and cleat system and is so effective that it is factory approved by Speedplay.